I always opt for using high quality dark chocolate 72% or more. I also added cocao powder, for a boost of superfood nutrients and added chocolate flavor, can't hurt right? Again, I sweetened this recipe with an all-natural sweetener, maple syrup. 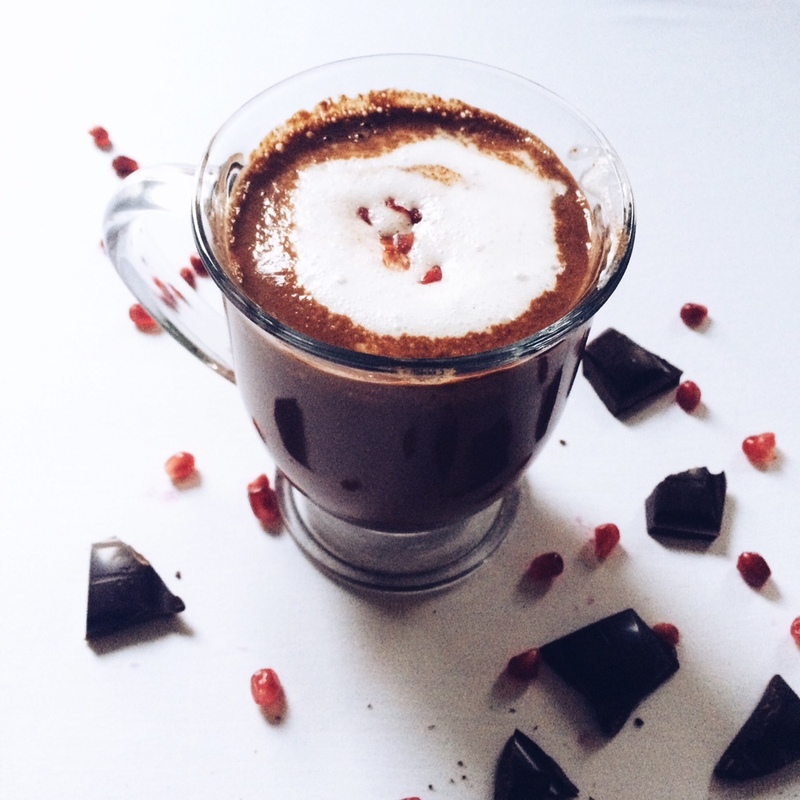 The dark chocolate and cocao powder can be quite bitter, but the maple syrup and Bai5 Ipanema Pomegranate balance out this hot chocolate perfectly. There are a variety of health benefits form eating dark chocolate as well. Not as sinful as you originally thought, huh? Disclaimer: everything in moderation. Dark chocolate and pure cocao are extremely high in antioxidants, one in particular, resveratrol, which has been demonstrated to protect the heart from heart disease. Dark chocolate and cocao are also high in iron and magnesium, so you may want to think twice next time you are crave chocolate, because your body may be trying to tell you something. Oh and it gets better…I even whipped up a dairy-free but heavenly whipped cream!! It came out tasting like vanilla ice cream, I almost ate the entire jar…And guess what it's made out of…almond milk! Ok now heres the best part, the recipe. I'll let it speak for itself. Hope you find an excuse to curl with this hot chocolate to keep you warm! 1. On low heat whisk all ingredients together in saucepan and mix until chocolate is completely melted and mixture has begun to boil. 1. Place all ingredients in a high speed blender or food processor, if using a vitamin, start on low speed and then gradually to high speed. 2. Blend until desired consistency is reached, it won't get too thick without the anthem gum. If serving immediately add a few ice cubes to cool down. 3. I didn't have xantham gum, so I placed my mixture in the freezer for about and hour and then scooped a dollop for on top of the hot chocolate, and it was perfect! In the wintertime I always crave good hot chocolate. It’s not as easy to come across vegan hot chocolates but it also isn’t hard to make at home yourself! So I whipped up a delicious superfood version of my favorite wintertime drink. Using raw cocao powder instead of the conventional cocoa powder makes all the difference. No longer will your hot chocolate indulgence be a “guilty” pleasure! Cocao is the purest form of chocolate you can consume, and is way less processed than cocoa powder, meaning you receive more nutrients, and antioxidants. It is also known to be the highest source of magnesium of all foods. Cacao powder contains more fiber and calories than cocoa powder since more of the nutrients from the whole bean are still intact. Cacao is an excellent source of monounsaturated fats, cholesterol-free saturated fats, vitamins, minerals, fiber, natural carbohydrates, and protein which make is a powerful superfood ingredient! I also used organic coconut sugar and maple syrup instead of processed white sugar in this recipe. This way the hot chocolate is sweet, but with all natural sweeteners, and when I say all natural, I literally mean ALL NATURAL! No gimmicks or false advertising here. I want to avoid any harmful sweeteners at all costs. So coconut sugar and real maple syrup (not the Aunt Jemima stuff) are healthy and naturally sweet! Yay! I even added shredded coconut on the top of my hot cocao to finish it off, because i’m not a big marshmallow fan, and i figured why not!? It came out delicious and provided a nice texture. So keep this recipe on hand for cozy warm nights or days when you’re snowed in, or just whenever you crave a hot chocolate. You won’t have to cringe anymore at the thought, because enow you have a healthy version to keep in mind! Nourishing, delicious, and tasty, I hope you enjoy! Heat up almond milk on low-medium heat until it begins to bubble, then put on low heat. Add in coconut sugar, maple syrup, cocao powder, salt, cinnamon, and whisk until mixed completely. Taste and add anymore ingredients according to taste. Pour into cups and sprinkle with shredded coconut or a dash of cinnamon if desired. Drink and enjoy! Peach season may be ending, but don’t worry because frozen peaches are always available to buy! Did you know that frozen fruits and vegetables are sometimes more nutritious than fresh fruits and vegatables? This is because the frozen fruit and vegetables are picked when ripe and frozen immediately. Instead of being picked prematurely to ripen off the vine. 1. Use frozen fruit: Whether you freeze your fresh fruit at home or you buy it in the store, adding frozen fruit to your smoothies will make sure your smoothies are icy cold. Adding ice instead of frozen fruit works as well, but it waters down the flavors of your smoothie and doesn’t make your smoothie as cold as frozen fruit does. 2.Use a liquid that goes with your smoothies flavors: Coconut water, and almond milk are the liquids I always choose to use. Water works as well, but I like the coconut flavor that the coconut water adds, and the almond milk provides a nice creaminess. I always use my homemade almond milk recipe, which is super simple and delicious! When making more tropical flavored smoothies opt for coconut water and when wanting a more creamy smoothie use almond milk. 3. Add in leafy greens: I love to add in fresh spinach or kale into my smoothies and smoothie bowls. Just a little goes a long way, and the sweetness of the fruits always cover up the bitterness of the greens. You smoothie will be rich in nutrients and you’ll get a serving of greens! 4. Use nuts, nut butter, or vegan protein: Add more protein to your smoothies with protein rich foods like nuts, nut butter, hemp seeds, or vegan protein. After working out its great to drink a protein rich smoothie, because it digests easily and helps your muscles recover and grow. My favorite brand of vegan protein powder is Sunwarrior Protein, because all of their ingredients are plant-based and recognizable; no harmful additives, chemicals, or added sugars. 5. Use berries: Berries are lower in calories and sugars compared to fruits like mango, pineapple, and banana. They are also rich in fiber, and antioxidants. This smoothie is filled with peach flavor, and the fresh coconut water gives it a tropical feel. Blend ingredients together in blender until smooth. Serve and enjoy! You may be thinking to yourself, why didn't I think of this sooner? Thats what I thought when I made my first batch of nut milk. Its super easy and simple to make, and you really don't need that many ingredients. So why do we keep buying store-brand nut milks?! Because its right there when you shop for your groceries? Okay I get it. Its "easier." But let me break it down for you. How much are you spending on nut milk? My boyfriend and I were going through 1-2 half gallons of nut milk a week, and in New York City it costs $5 per half gallon. Equalling $5-$10 of nut milk a week. A half gallon equals 8 cups. Heres an example of what is costs to make almond milk. 1 pound of raw almonds from trader Joe's cost me $6.99. 1 pound of almonds yields 4 cups. With 1 cup of raw almonds I can make 4 cups of almond milk, so with 4 cups of almonds I can make 16 cups of almond milk! Thats twice the amount of almond milk that I would get for a half a gallon of store brand almond milk that used to cost me $5. Lets compare…Store brand almond milk filled with harmful chemicals and additives cost me $5 for 8 cups. My homemade, pure, all-natural almond milk costs me $3.50 for 8 cups. WIN! Yes, different nuts vary in price, but I'm sure you will make almond milk the most, because it's super versatile. However, I tried experimented with making pistachio milk! I know right?! Sounds amazing, and it was! Super creamy, with a hint of pistachio flavor, and it came out a beautiful creamy pastel green. 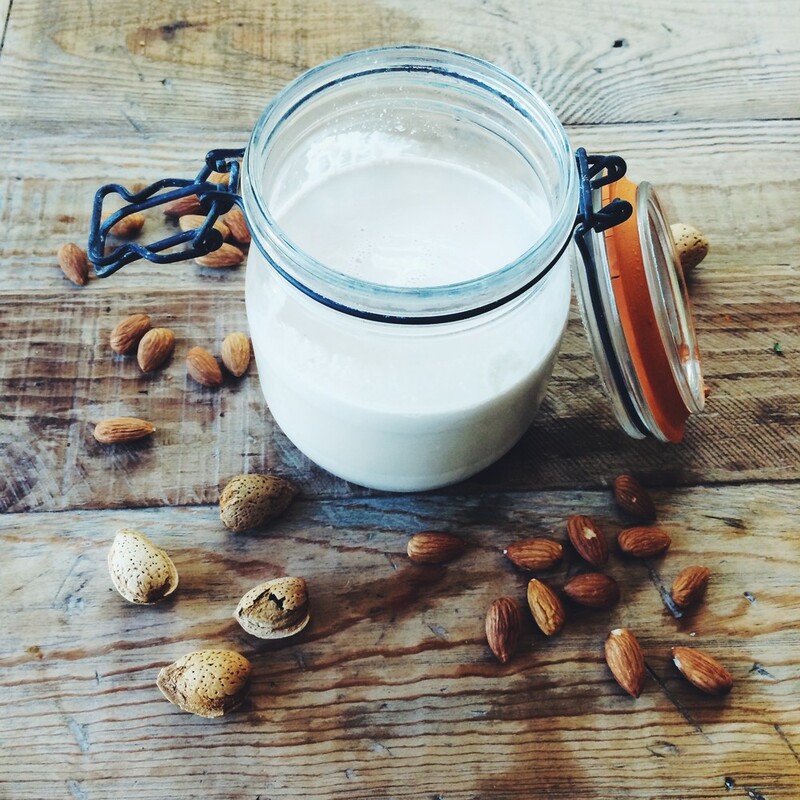 Many almond milks contain a harmful ingredient that you should look out for called carrageenan. Carrageenan, which has no nutritional value, has been used as a thickener and emulsifier to improve the texture of ice cream, yogurt, cottage cheese, soy milk and other processed foods. Research has shown that exposure to carrageenan causes inflammation and that when we consume processed foods containing it, we ingest enough to cause inflammation in our bodies. All forms of carrageenan are capable of causing inflammation. Chronic inflammation is a root cause of many serious diseases including heart disease, Alzheimer's, and Parkinson's diseases, and cancer. When laboratory mice were exposed to low concentrations of carrageenan for 18 days, they developed a "profound" glucose intolerance and impaired insulin action, both of which can lead to diabetes. This is extremely scary to learn, when carrageenan is being added to so many processed products on the market and it being consumed unknowingly. We think almond milk, a great milk alternative, yes. But companies still find a way to sneak in harmful ingredients into our products and body's. Would you consume something that could potentially cancer or diabetes? I didn't think so. If you do have to buy store brand almond milk, I recommend buying Silk's Unsweetened Original Almond Milk, because this does not contain carrageenan. But if you have the time, make it yourself! It tastes so much better, is better for you, and cheaper! Really can't go wrong! 1. Soak 1 cup of nuts for at least 12 hours in water. 2. Drain water that the nuts were soaked in. 3. Boil 4 cups of water. 4. Add the soaked nuts and 4 cups of boiling water to blender with salt, and sweetener (maple syrup or date), and vanilla extract if you like. 5. Blend until nuts have been liquified. 6. Strain mixture in a bowl with a fine strainer or cheese cloth to separate milk from the nut meat. 7. 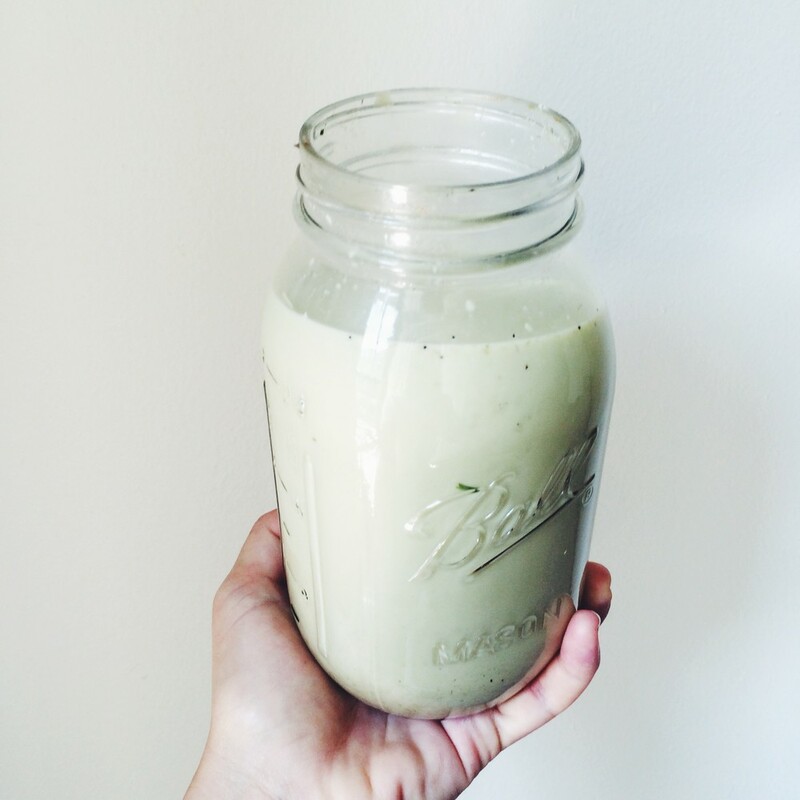 Store nut milk in mason jar, and use within 3-4 days. I just purchased my first jar of raw cocao powder, and want to use it in as many recipes as I can! So naturally I infused my morning smoothie with some! Not only is raw cocao a superfood filled with antioxidants but it also improves your blood circulation, and lowers your risk of heart disease. It gives your recipes a chocolaty flavor without an overwhelming amount of sweetness. Which allows you to control the sugars that you consume. I like using bananas for this specific reason. To sweeten my smoothies and other recipes, in a natural way. Now that I'm back home from Europe and reunited with my blender, I'm going to be making smoothies every morning! I didn't have a blender in Europe and was seriously going through withdrawals, It seemed like every recipe I wanted to make required a blender, and I couldn't make smoothies in the morning! The frozen banana makes this smoothie rich, sweet, and creamy. The raw cocao powder adds a dark chocolate flavor, and the peanut butter adds protein and brings this smoothie together. This recipe tastes like a peanut butter cup! Be sure to use organic ripened bananas, because the flavor they provide makes all the difference. 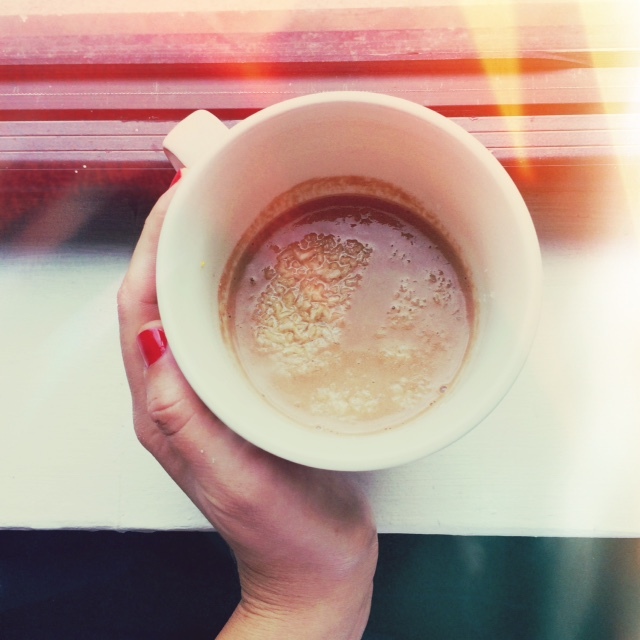 You don't have to feel guilty drinking this in the morning! Super healthy and flavorful! Its even a great option to make this when you're craving something sweet! Hope you enjoy this as much as as I did! This hit the spot. Humid summer mornings call for fruity refreshing smoothies! I added some almond butter to add some protein, and Justin's Maple Almond Butter is my absolute favorite! My goal is to begin making my own almond milk at home, instead of buying it in stores. They put so much additives in the ones in stores, all almond milk really needs are almonds, water, and maybe some dates to sweeten it! Speaking of goals…I've been having a lot on my plate lately. 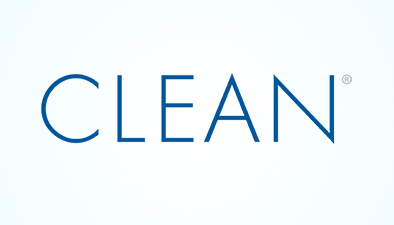 Blogging, setting up a program when working with clients, and studying to name a few. Doing everything at once can become overwhelming. I've found that writing a list of what needs to get done then planning out day by day what I will do on certain days, makes these tasks more manageable, and I don't have to constantly worry about what needs to get done, because I know it all will. I definitely recommend investing in a calendar where you write your overall goals for the month, and then schedule day by day what you will do to work towards achieving them. It sounds simple, and it is, and you will feel so less stressed, believe me! Anyways, summer is a time to relax. So remember to make time for yourself no matter how many things you have on your plate, and enjoy a refreshing smoothie!